Solar air conditioning refers to any air conditioning (cooling) system that uses solar power. 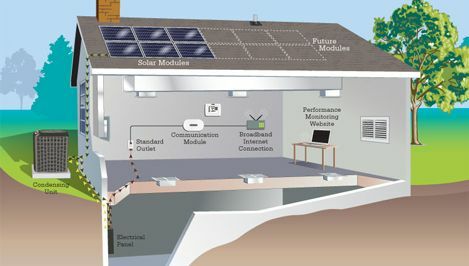 This can be done through passive solar thermal energy conversion and photovoltaic conversion (sunlight to electricity). The core to the cooling of an air conditioner is a refrigerant that moves in the air conditioning system. The refrigerant comes in as a cool low-pressure gas in the compressor, which uses electricity to compress it to a high-energy hot gas. The fluid then goes into the condenser where it dissipates all the heat and converts into very cold liquid under high pressure. It then goes into the evaporator where it cools the room air, which is thrown out. The air conditioners that we see all around us require electricity to cool the rooms. Solar air conditioners use energy from sun to provide some or all of the energy required to produce cooling. Hence, by using solar air conditioners you can eliminate the need of electricity required for cooling. In a typical house using air conditioners, the electricity required for cooling can be as high as 30-40% of the total electricity used. Air conditioners are one of the major contributors to peak demand for electricity and solar air conditioners offer the benefit of peak load shifting in addition to the reduction in total energy requirement thereby reducing stress on the grid.